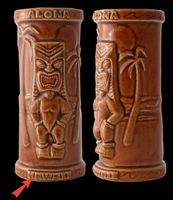 Tiki on the Beach Mug - HAWAII; These cool Hawaiian Tiki Mugs are designed by Squid, features a head-dressed Tiki with hands on the hips enjoying all that the beach has to offer! You might want to stay off his beach and go find your own! These Ceramic Tiki Cups are 6 inches high and have a 10 oz. capacity. Our Hawaiian Cups also include FREE SHIPPING.